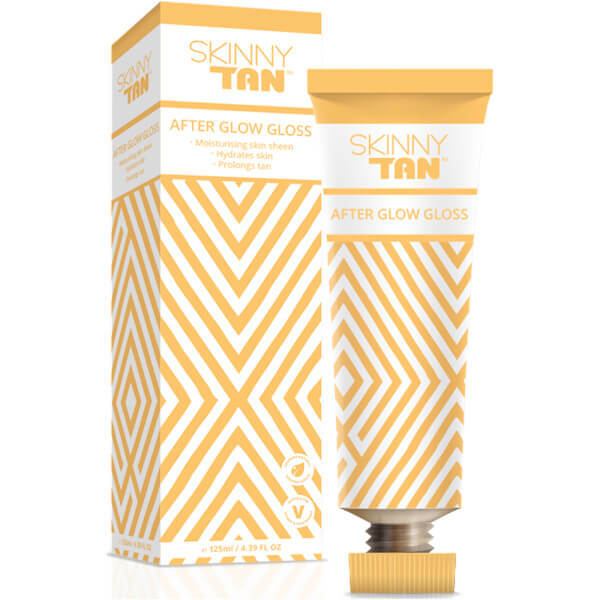 Stand out from the crowd with the SKINNY TAN After Glow Gloss; a hydrating formula that maintains skin’s healthy moisture levels, whilst delivering an enviable high-shine finish that works to enhance any tan. Without the use of gimmicky glitter, the gloss glides over skin and instantly offers high-shine results. The silky formula is enriched with Sunflower and Coconut oil, which work in synergy to provide the body with a veil of luxurious moisture. This continues to hydrate skin throughout the day, ensuring the body is ultra-comfortable, yet radiant and glossy. Expect a beautifully bronzed, red carpet finish. Apply after your choice of tanning to give an instant high shine finish. This can be applied with hands the Skinny Tan Mitt. The formal will continue to moisturise skin through the day. Helianthus Annuus (Sunflower) Seed Oil, Silica, Cocos Nucifera (Coconut) Oil, Macadamia Integrifolia (Macadamia) Seed Oil, Ricinus Communis (Castor) Seed Oil, Parfum (Fragrance).